The Odorous House Ant is found throughout the United States. They are often commonly called sugar ants, pest ants, little black ants and even piss ants by some. This pest is often found foraging for food in long trails over household surfaces and can contaminate food products in your home. Odorous House Ants are tiny, about 1/8”long and are dark brown to black in color. They can be easily identified by the sweet-sour coconut odor that is produced when their bodies are crushed. Odorous House Ants may develop huge colonies, ranging in size from several hundred to over 100,000 individuals. These ants can produce hundreds of egg-laying queens and thousands of workers. The male and female reproductives are often called winged swarmers or ant swarmers. Swarmer ants first appear in early summer months. The male ant swarmer will emerge from the parent colony first, followed by the new queen. Odorous House Ant eggs have an incubation period from 11 to 26 days. Each colony will have several queens laying eggs, but each may deposit only one egg per day. The worker and the queens live for several years while males usually die a few days after mating and the mated females begin new colonies. The queens continue laying eggs until late fall. During the winter months, you will find adults foraging inside. Please note: cold weather will not stop activity, just decrease it. In spring, workers begin foraging in full force and queens resume their egg laying. We have experienced new customer service requests in the Spring when the colony has expanded all winter long and is now in full force foraging mode. Where Can You Find Odorous House Ants? Odorous House Ants can nest in many different places both indoors and out. Inside, these ants usually construct their nest in wall voids, under carpets, behind paneling, in crevices, in cupboards and especially around hot water pipes and heaters. Outside, they are found in exposed soil, mulch, usually shallow, and stone, boards, bricks, and other debris etc. They will use small entry sources such as tree limbs or cracks and crevices to enter a house. They will most likely enter buildings when their food is reduced by excessive rain or drought. Trimming landscape away from the home and removing stored items such as firewood, potted plants and building material from the foundation will assist in the prevention and treatment of an odorous house ant infestation. The most important key to ant control is species identification and inspection which cannot be done over the phone. 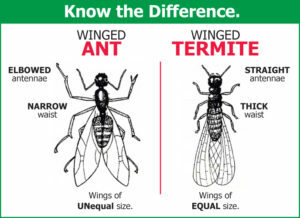 It is our policy to identify the insect(s) in question, note all conducive conditions that may contribute to the infestation, communicate all options and devise a plan to rid your home of the infestation and keep it from reoccurring. These ants are extremely invasive in our region. The odorous house ant is one of the fastest reproducing ant species on Delmarva. Unlike other regional ant species, odorous house ants have many secondary reproducers which allow the colonies to expand or “bud” rapidly. Odorous house ants are best controlled when the colony and satellite colonies are located and treated directly. The odorous house ant is very opportunistic and often takes advantage of your home’s inaccessible areas. On warm days in January, we have observed odorous house ants moving from mulch beds, up the foundation, and into structures. Undetected, the ants now have a perfect environment to expand and thrive. As warmer weather approaches, foraging ants will be seen invading your living space. It is difficult for any professional to completely eliminate or rid your home of odorous house ant infestation once they have established residency within a structure. As pest control professionals, we cannot always locate colonies for elimination or extermination due to their secretive nature. Often odorous house ant infestations take time, patience, several visits, and perseverance to properly manage. We ask that you understand that there is no one “magic wand” available to the Pest Control Industry that will eliminate an odorous house ant problem immediately. Our free thorough inspection by a certified professional technician will identify and discuss any conducive conditions that may contribute to the odorous house infestation and provide you with a detailed solution to rid your home of the ants and keep them from coming back.